Winter White And Campbell Dwarf Hamsters: How Do You Tell Them Apart? In the world of furry, adorable little critters of Dwarf Hamsters, you may well be no stranger to the different species available in our local Pet stores. We recall the very first encounter with a Dwarf Hamster in Singapore to be more than a decade ago. Initially, we'd only differentiate them via markings and colours, but it gets a little tricky when it comes to a Winter White and Campbell's Dwarf Hamster— how do you tell them apart? Fun Fact Did you know, that there are only 4 species of Dwarf Hamsters currently available as domestic Pets throughout the world? We'll let you in on the top 3 ways of telling these two Dwarf Hamster species apart, including care tips when owning your very own. Winter White Dwarf Hamster — Also known by various names, including Siberian and Djungarian Dwarf Hamster. As one could've guessed by now, they originate from none other than Siberia. Winter White Dwarf Hamsters are well-revered to have excellent camouflages in the snowy climate of Siberia, protecting themselves from predators by changing their fur completely white. Reports by owners of this natural phenomenon usually occurs during the wintry seasons. However, the chances of this happening with a Winter White in domestic captivity may vary— especially once your Pet Hammie learns that camouflaging is unnecessary in its current surroundings. If any, slight appearances of white fur all around can be spotted as they approach adulthood. 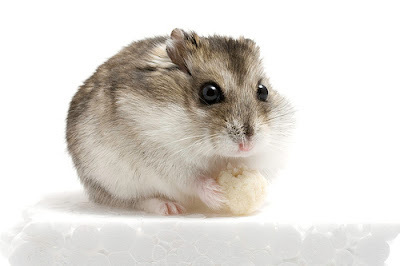 Campbell Dwarf Hamster — With no relation to the soup brand we are all so familiar with, the Campbell Dawrf Hamster is instead, a name given by British Zoologist Oldfield Thomas. This was in honour of of the man whom collected the very first Campbell Dwarf Hamster specimen from Mongolia in 1902, named Charles William Campbell. Thus confirming the Campbell Dwarf Hamster's origin to be Mongolia. 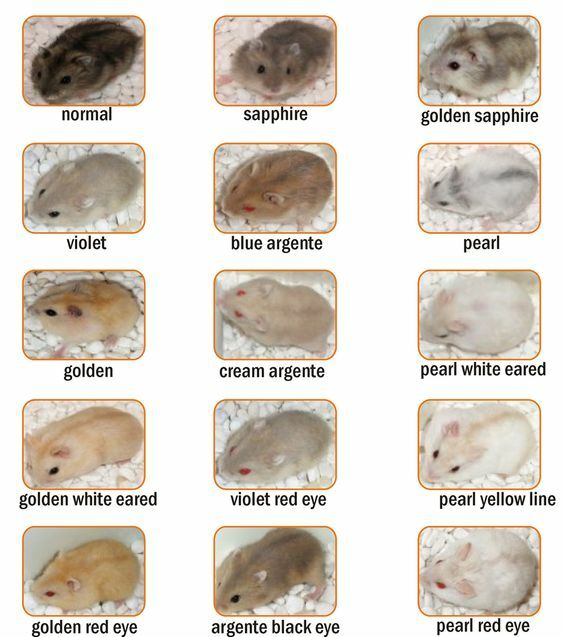 Pure-bred species of a Winter White and Campbell Dwarf Hamsters have significant differences in facial features. 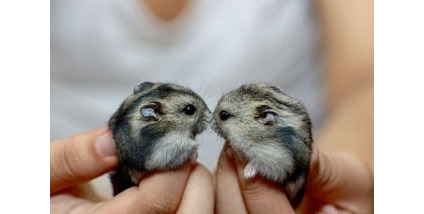 The average size of an adult dwarf Hamster measures 7 to 9 cm. Winter White Dwarf Hamster — A wider, circular face. From front, larger and wider-set eyes. Ears are smaller and rounded out. Profile view is noticeably flatter as compared to a Campbell Dwarf Hamster. 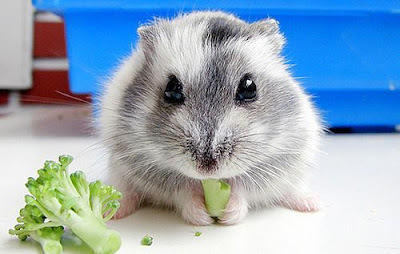 Campbell Dwarf Hamster — Sharper face with smaller and closer-set eyes. Ears are sitting in a more upright placement with slightly sharper tips. Profile view is pointier and evidently longer. Another way of telling these two species apart is by their unique coat markings. Winter White Dwarf Hamster — Usually carries a slightly narrower dorsal stripe marking down their backs, leading to three arches of a lighter shade on each side of their bodies. The coat colouration contrast that separates their bellies from the top is pretty obvious. Winter Whites are also reportedly hairier on the feet regions. 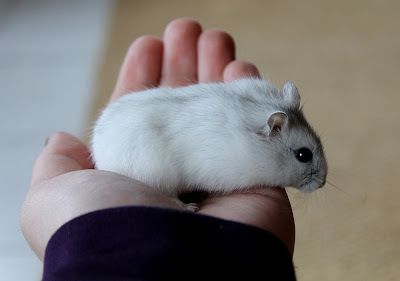 Campbell Dwarf Hamster — Campbells' too carry a dorsal stripe marking, however, theirs is said to be possibly a little thicker as compared to the Winter Whites, not as vivid, and do not form a crown or patch on their heads. Coat colouration that separates their white belly regions from the top is usually blended in by a soft beige-brown. Fortunately, there isn’t a vast difference when it comes to the personalities of the two species— Winter Whites and Campbell Dwarf Hamsters are playful, active, and love receiving affection from their owners. The only time you'd encounter any form of aggression is close to none, but if you do, something might be amiss with your Dwarf Hammie, causing discomfort and unfriendliness. Have them medically checked immediately. Look at this Winter White go! Winter White Dwarf Hamsters are perhaps the most vocal amongst all, as reported by most owners. They often squeak when they are in danger or whilst rough-housing within the cage. And while Winter Whites are very adaptable in the cold, Campbells are less tolerant. Regardless, these Dwarf Hammies keep themselves warm by moving about and exercising— talk about a warm-up! 1. Housing & Bedding — A hamster cage should always be of ample space for them to run around, play and burrow. Because of their dwarf sizes, ensure your cages do not have wide grill gaps, otherwise the dwarf hamsters could easily escape. As always, avoid pine and cedar wood bedding as they pose high risks of respiratory problems for many animals. 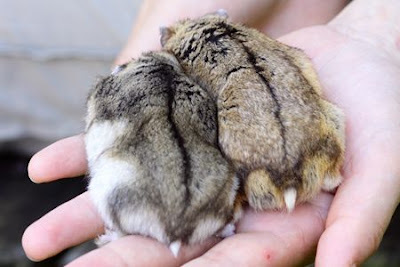 Dwarf hamsters can get territorial if their housemates are not from the same litter, try to introduce them at an early stage if possible to avoid hostility within the same cage. Otherwise, fights can lead to serious injuries. 2. 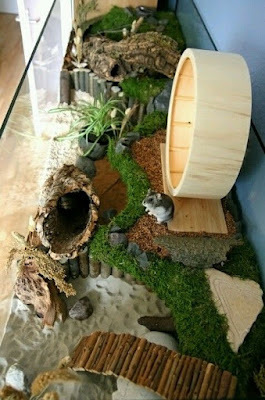 Toys & Accessories — Include toys such as the good ol’ hamster wheel, tunnels and even tiny houses for hiding and resting spots. Wooden toys can be provided for them to keep their teeth in check, they would have to chew to prevent overgrown teeth. Throw in an empty toilet roll every once in a while and watch how your hammies destroy or even make a home out of it! 3. Food — Hamster feeds are readily available at any pet stores, with a good mixture of nuts and seeds. While it is healthy to feed them safe treats such as fruits and greens, always note to feed in small portions and moderation. Similar to many animals, a dwarf hamster must absolutely not consume any caffeine or alcoholic products— food items such as/containing Chocolate and/or Coffee are a definite NO. 4. Hygiene — Keeping your dwarf hamster clean is easy, they do not require water baths. Only bath them if absolutely necessary, i.e. if they can’t get certain stains off or if they are starting to give off a stench (this is most likely due to its living space instead, keep it clean at all times!). A damp towel works great as well, and if you have to use shampoo, choose an unscented, pet-friendly one. Always make sure your Hamsters are completely dry— Dwarf hamsters are very susceptible to cold, and water baths also results in stripping off the protective layer on their coats. Can I Bath My Hamster In Water? : 6 Ways To Keep A Hamster Clean! 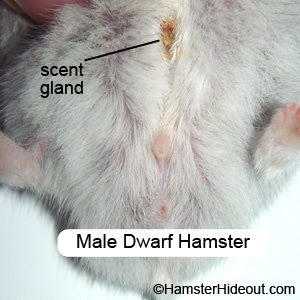 You may locate a spot on the underside of a Male dwarf hamster that is slighty protruding, that would be their scent glands, used for marking territories, and tracing steps. It could get a little soiled sometimes— use a cotton swab or cotton ball with warm water to clean it. Always make sure they are thoroughly dried after. Which Dwarf Hamster Species Should I Pick? It is safe to say that there aren’t many pure-bred Winter Whites or Campbells sold in Pet Stores anymore, as excessive crossbreeding has since further shrouded the possibilities of pure-bred lines in the world. Most of what we see today are cross-bred, in a variety of available colours and markings. But regardless of which, we can’t deny the fact that they are a lot of fun, packed into a tiny body! A dwarf hamster’s typical life span in the wild is 1 year, but in captivity with proper care, they live up to 3 years or more. Just be a little careful with young children handling these little creatures, adult supervision would prevent mishandling or accidentally dropping them. Hamsters Of Instagram: Tiny Pets, Massive Fun and Love! Got a tip of your own? Your voices are important to us and the Pets community! Our readers are encouraged to share their Pet-related reviews of a place and its services, experiences, even lifestyle tips and tricks to better our Pets lives, on our platform, one paw at a time. Be a part of an educational and informative Pets community because at ThePetsDialogue, your voices could make a huge difference.